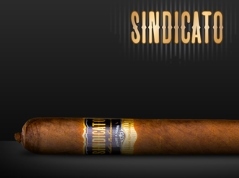 1) Sindicato, the first cigar outfit to be launched by a formidable “syndicate” of veteran tobacco retailers, is now shipping its new eponymous flagship cigar to hundreds of tobacconists. The line will be available in 6 sizes and sell for $10 to $14. Made at Casa Fernandez in Nicaragua, it will be a square-pressed Nicaraguan puro complete with a shade-grown Corojo wrapper. “Master blender Arsenio Ramos has combined this unique wrapper with a rich, bold Estelí double leaf binder, which encompasses a blend of strong, flavorful Jalapa and Estelí leaves and delivers a medium-full strength cigar with exquisite taste,” reads a Sindicato press release. Sindicato is headed by Jim Colucci, formerly EVP of sales for Altadis. The retailers who formed the company include Abe Dababneh (Smoke Inn in Florida), Dan Jenuwine (Quality Fresh Cigars in Michigan), Gary Pesh (Old Virginia Tobacco in Virginia), Robert Roth (Nice Ash Cigars in New York and Pennsylvania), and Jeff Borysiewicz (Corona Cigar Company in Orlando). Sindicato is also the maker of the Hex, Affinity, and Casa Bella lines. 2) Padrón Cigars turns 50 years old in September, and the company is celebrating with two new ultra-premium lines due out this fall. The first will be the Family Reserve 50, which will be made in small quantities yet become a permanent fixture in the Padrón portfolio. The second will be sold in 50-count quantities and packaged in special humidors. Only 500 humidors will be made, and only the owners of these humidors will be able to purchase 50-cigar refills once a year for up to 5 years. 3) Last Thursday, the FDA announced a proposed rule to regulate cigars that would devastate the handmade cigars we enjoy, and of course StogieGuys.com is on top of it. Read our primer on what the FDA deeming document means for cigars and also check out yesterday’s commentary on probably the most controversial aspect of the proposed rule, the $10 exemption for “premium cigars” and why it’s worse than you realize. We’ll have more in the coming weeks on this critical issue. 4) Inside the Industry: General Cigar announced the new 1907 by Dunhill, made with a Honduran Olancho wrapper, Dominican Olor binder, and Dominican Ligero and Brazilian Mata Fina filler; it will come in four sizes with suggested prices from $8.35 to $9.25. Drew Estate is adding a limited edition (2,000 boxes) Herrera Estelí in the Lancero size, available soon in 15-count boxes with a suggested retail price of $12 per cigar. 5) Around the Blogs: Stogie Review reviews a Camacho Diploma 11/18. Stogie Fresh fires up a Regious of London White Label. Leaf Enthusiast checks out the Davidoff Royal Robusto. Cigar Fan fires up the Ezra Zion FHK and Rodrigo Fortaleza. Cigar Inspector inspects the Curivari Buenaventura. 6) Deal of the Week: Emerson’s Cigars has pre-orders available on two new offerings from Tatuaje. Move quickly to pick up the new lancero sampler, which has ten Tatuaje blends each in a lancero size. Also available is the new Tattoo line. These are sure to go quickly.